The Nebula jacket, Cargo pant and Aluminum fleece jacket makes a complete outfit for snowboarding or skiing. Colors are coordinating featuring wedgewood, toast and black. The Nebula jacket features exterior, zip-off hood with HydroMesh lining, 160 gm Permaloft insulation, interior waist and hem drawcord. The Cargo pant features 60 gm Permaloft insulation, elastic waist with adjustable webbing belt, AbradeGuarde hem and water-resistant powder cuffs with gripper elastic. Plus a radio pocket! Color is toast. The Aluminum fleece jacket features 100 wt microfleece, full zip and handwarmer pockets. The Cool Factor: "It's really cool - my friends all want one. It's a lot warmer than my other jacket - I'm never cold!" Functionality: The jacket is very functional. It is adjustable so I can get one more season out of it. 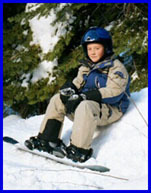 The snow pants are really tough - my other ones get ripped easily, these are thicker material and they stay really dry. I also really like the polar fleece when it's not a very cold day - it is super soft. Where do you use it? I wear the jacket to school almost every day. I wear the whole outfit every time I go snowboarding at Diamond Peak (two to three times a week). I got a new snowskate, so I'll be wearing the outfit in my yard when I do that.